An old council shed still in use today on the Racecourse Park, Northampton. This shed has been sprayed over ever since I can remember, back in the 90s and still today. 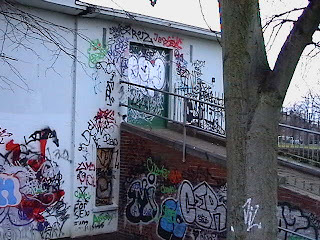 This shot's from 2003 where the entire building was more or less tagged up, it use to be a hazardous hotbed with poles, bricks, metal all sprinkled around leaving it dangerous.